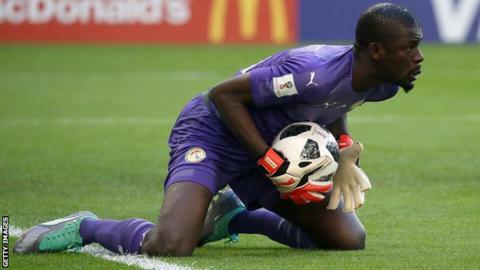 Horoya's goalkeeper Khadim Ndiaye played in all of Senegal's matches at the 2018 Russia World Cup. Guinean side Horoya AC have extended the contract of their Senegal goalkeeper Khadim Ndiaye following his double leg break on Saturday. The 34-year-old, who played in all of Senegal's games at the 2018 World Cup, suffered the injury in the second leg of their Champions League quarter-final in Morocco against Wydad Casablanca. Ndiaye's contract was due to end this year but the club "wanted to ensure his immediate future by extending his contract for three years from today (14 April)." The goalkeeper received several minutes of treatment following a collision with teammate Boubacar Samassekou, before being stretchered off in the 5-0 defeat. "The results are reassuring and he will remain at the Cheick Zaidi University hospital where he will continue his recovery," Horoya announced on social media. It was a double setback for the Guinean club who had hoped for better in the Champions League following a goalless first leg against Wydad Casablanca in Guinea last weekend. After the World Cup Ndiaye was quoted as saying he would not leave Horoya, even if Barcelona offered him a deal. However in recent times he has been overlooked by Senegal coach Aliou Cisse, who has left him out of his selections since the end of the tournament in Russia.